Heat the oil in a large skillet. Add the beef and brown thoroughly. Remove and reserve the brisket. Add the stock and tomato sauce to the pan. Return the brisket to the pan, cover tightly and bring to a boil. 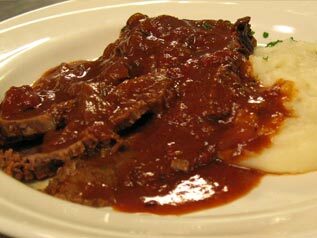 Braise at 325°F (160°C) for 1 ½ hours, basting or turning the brisket often. Combine the remaining ingredients and add to the pan. Continue cooking and basting the brisket until tender, approximately 1 hour. Remove the brisket, degrease the sauce and adjust its consistency and seasonings. Do not strain the sauce. Slice the brisket against the grain and serve with the sauce.